For the month of December, we have a SPECIAL. 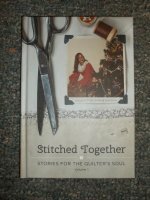 If you spend $25, you can purchase the book, Stitched Together, by Jenny Doan for $9.95. You may purchase as many as you would like. These would make great Christmas gifts for your favorite quilting friend or say, "Merry Christmas to myself!" This is a book with 52 stories for the quilter's soul. Stop in and check it out! We'll look forward to seeing you on Tuesday evening or Wednesday morning!